If you're feeling guilty about that fifth slice of pie you had after dinner, you might want to consider avoiding scales until you can weigh yourself on this educational aide. 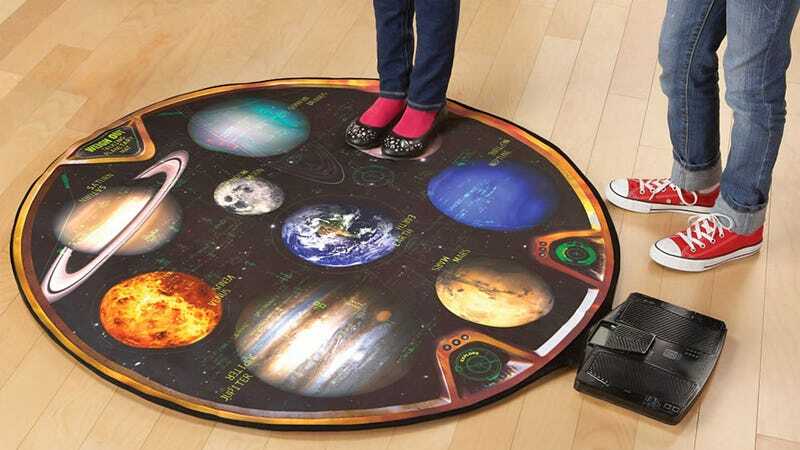 It's designed to teach kids facts about the solar system, but more importantly, the varying effects of gravity on each planet. As you step on one of the eight planets (that's right Pluto, you're still demoted) as well as the Earth's moon, you'll hear facts and tidbits about each celestial body's characteristics—voiced by none other than Dr. Neil deGrasse Tyson. But the real attraction is the $50 mat's built-in scale. When you first step on it you'll see your current weight here on earth (up to 220 pounds) but as you step onto other planets you'll see your weight fluctuate according to each planet's gravity. So if you're feeling really guilty about a recent binge, you'll want to stick to Mercury, Venus, Mars, and Uranus where the gravity is less than Earth's. But avoid Jupiter at all costs if you're on a diet and don't want to weight in like a small elephant.